Removing vinyl siding is one of the best things one can do to a house. As much as a homeowner may want good curb appeal, their house will never have the appeal of homes of those who understand and appreciate good curb appeal . Unfortunately there are many people who just don’t know any better and love their shiny plastic. But for those that do there is a wave of homeowners removing vinyl siding and aluminum from their homes and allowing the beauty to return. The Great Unveiling – removing vinyl siding party. Here is the story written by a historic neighborhood organization making things happen. 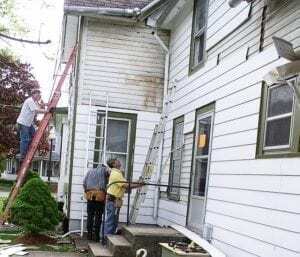 Several years ago there was an article in the Illinois Association of Historic Preservation Commission’s newsletter regarding the program started in Rock Island, IL for the removing vinyl siding by volunteers. The Gifford Park Association, a neighborhood organization in Elgin, IL was so impressed with the idea that we decided to try it. We found their name, “The Great Unveiling” to be very catchy so we asked for and received their permission to use it. We decided to add to their idea by offering a $1,000 (proceeds from our house-walk) for any homeowner willing to let volunteers remove their siding. We decided to make it a part of our Preservation Week festivities by doing it on the last Saturday of Preservation Week. 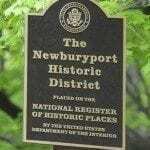 We hand delivered a catchy flier to each home in the Historic District (over 600) to advertise the program. Our first year we had only one taker but it was a once in a lifetime chance that had the potential to be spectacular. Rumors had been circulating for years that a small, nondescript home in the district was actually a cobblestone built by a prominent resident in the 1850s. Most found that hard to believe. The owner asked us to do a small test patch to finally settle the question. We took off a small piece of wide exposure aluminum siding only to find stucco underneath. We then broke into the stucco with a large hammer and found…COBBLESTONES with tooled tuck-pointing!!!! The owner was warned that the stucco removal would probably remove some of the fancy tuck pointing which could be expensive to restore. She was told that the $1,000 reward would probably only be a small portion or what would be needed. She was undaunted and excited about proceeding. We sent out a flier to members and assembled quite a motley crew for an old-fashioned barn-raising event including lots of refreshments. The press showed up and gave us some nice coverage. One of the reporters actually took a pry bar and joined in the fun. He found the destruction to be the exact therapy he needed for his job. Well into the morning, our jaws literally dropped to the ground when we discovered round porch columns made of cobblestones had been framed over with aluminum. With lots of volunteers, the entire job and cleanup was actually finished before lunch. Several feet of sub sandwiches completed a very, very fun and satisfying day. The owners worst nightmares were realized when she received bids between $7,000 and $12,000 to remake one entire column and re-point the remainder of the tiny house. She bit the bullet and went ahead with the project leaving us with a wonderful addition to our neighborhood. The following year she received a Mayor’s award during our Preservation Week festivities. Since that first exciting unveiling in 1997, we have been responsible for thirteen more. 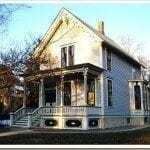 Elgin has three historic districts so we decided to try to do at least one in each every year. The Heritage Commission helped with the rewards and other prominent neighborhood organizations took the responsibility for the actual unveiling in their respective neighborhoods. Our record year came in 2001 when FIVE homes were unveiled all in one day – all but one was complete before lunch. A picnic in the park with a check issuing ceremony highlighted our day. Before signing up candidates, we do go to their home with a ladder to do a test patch. Aluminum siding has to be taken off from the top down if you don’t want to ruin it. If the homeowner backs out, we have to be able to put the test piece back. 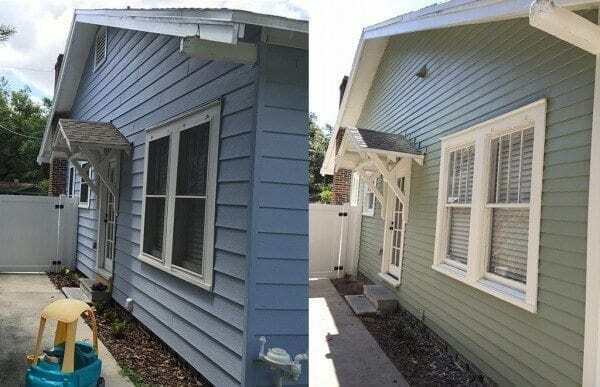 Before committing to the program, the homeowners need to know if there are clapboards under the siding and the extent to which details have been removed. Often corner boards or window casings and hoods are removed to create a flat surface. Homeowners need to be thoroughly cautioned about the expenses that they could face. We do recycle any aluminum, which typically gives the homeowner another $300. Any Styrofoam backing can be recycled if a thorough search is made for a recycler. Any other type of siding, we require the homeowners to get a dumpster to remove. We do not do asbestos siding because of the health hazards. We have had a hard time keeping insurance despite our volunteers signing a waiver. We also use volunteers to salvage architectural details on houses before they are bulldozed. Homeowners require us to have insurance and we have found it at a cost of about $1000 above our basic liability insurance for the house-walk. If your insurance company is currently covering your volunteer efforts, it might be wise not to ask any questions. I was inspired when I first read about Rock Island’s Great Unveiling. Hopefully your neighborhood will be moved to action by this article. Check out these photos here. If you still don’t understand how vinyl siding effects curb appeal click here. Wood is in good condition underneath. We removed the aluminum siding from our 1867 farmhouse. It’s not a fancy house, but it was a big white elephant with that horrible wide siding. It had been painted previously and when it was windy, it looked like it was snowing from the paint flaking off. Why you would paint something that was suppose to be “maintenance free” is beyond me. I talked to several contractors about removing the siding, most questioned my sanity and suggested I just paint it or replace it with vinyl. I finally found a contractor just as nuts as myself and we removed it all. The watertable had been removed as well as a few other various wood bits and there was a huge gap above a picture window. It was a good 8 feet by 1 1/2 foot gap. Guess they thought the siding would keep the cold out. It didn’t, by the way. We had to replace a few boards where they blew in insulation (not very well I must add), replace a few corner boards and such, as well as remove that 1960’s picture window (replaced it with two separate Windows like there used to be). I must say the house is now rather beautiful, after a historic paint job of course. Still working on the porches and such, but worth the time and effort it took. When strangers now tell you how pretty your house is it just a bonus to giving back the dignity the house deserves. Lisa may I ask what you paid to hire someone to remove siding? We have an 1899 Dutch colonial with asbestos siding underneath vinyl siding. I want to remove it myself but am wondering if it’s worth just hiring someone? Asbestos is a whole different story. If you hire someone I believe they have to be certified for asbestos removal. It varies by state I think, but I’m not sure. You might be better off removing it yourself and paying someone to fix the damage. Again, you’ll have to find out about the asbestos. The contractor I hired also rebuilt my back porch, repaired my front porch, did the siding removal/ repair as well as various other projects so as far as cost I couldn’t really say as it was a rather involved project. Wish I had a simple answer for you, but I don’t. Hi Lisa, thanks for your response! The City of Boston has loosened their rules to the point where removal of asbestos shingles is acceptable without special permits. I’m sure disposal is another story. I guess I was just wondering a general ballpark, even if that included the cost of your porches – I presume the cost would be similar with all uncovered repairs that our home would need after siding was removed. Just coming across this thread nearly 9 months later, but my wife and I bought a vinyl-sided home in Dorchester this past summer and went about removing the vinyl siding and restoring the wood clapboards. Initially our contractor said “if the clapboards are in good condition you should save a good bit of money compared to re-siding with vinyl”… but this has not really been the case. Although the majority (about 90%) of the wood clapboards are solid and in good shape, we (the contractor) had to do extensive work to rebuild the water table around the house, rebuild two levels of soffit/facia, re-flash and re-lead all of the roof lines, replace corner details that had rotted, and rebuild every window sill. He initially quoted about $27k to replace the vinyl siding with quality siding (some cedar impressions), but the restoration of the original clapboards/details will end up being a little north of $30k. To be clear, this was just to rebuild the aspects of the house that were hacked away for the vinyl and to make sure all of the rooflines are water-tight. I am responsible for all the scraping/sanding/painting which has been another project in-and-of itself. I ripped all of the vinyl and foam backing off the house in early August 2017 and thought I would take some vacation time and have it scraped/sanded/painted by early October. Well…I have ended up doing a much more thorough and quality job than I expected, but I will not completely finish the paint job this winter (the important parts are nearly complete, with the back still left for the Spring). After scraping by hand for a few days I came across the PaintShaver Pro, a planer type machine that shaves the top layers of paint off the clapboards and into a HEPA filtered vacuum. The resulting surface is amazing…looks like new clapboards instead of ones that have wavy layers that will inevitably peel within a few years. Since the PaintShaver Pro does not get into the sides/corners of each board I am using a heat gun and putty knife to scrape any remaining paint. It has been a colossal project for someone to do on weekends over a few months, but it is coming out amazing. To get back to your original question, the process to bring an old house back to its original state is expensive and time consuming….but we are blown away with how it is coming along. It is hard to believe that such detail and craftsmanship were hidden under ugly vinyl siding for so many years! I hope you have chosen to do the same! Let me know if you want to compare notes sometime. Hi Lisa, do you have a picture of the before and after of your home. We are contemplating removing the vinyl siding from our house and restoring and painting the clapboards on our 75+ year old well built home. Lisa, agree each state & city has their own rules and for Jacksonville Florida the home owner can do about anything. I had asbestos roof shingles and went to the city department and to my surprise they said I had no rules to live under and could even leave out for garbage people to pickup. I started talking to contractors to replace my aluminum siding with Hardie, but now I’m realizing that I don’t want to destroy the 90 year old wood clapboard underneath. What kind of contractor is the best way to go? It seems like a siding company is just going to want to sell me new siding instead of fixing what I already have. But there are so many steps – remove the aluminum, repair damaged wood and trim, scrape and paint – is it realistic to think I can find one contractor to do it all? Yes keep that old wood siding. You don’t want to contact a siding business. Find a carpenter that does both carpentry and painting. There are some that do it all. I’m very close to buying a 1900 home with wood siding that is currently covered in vinyl, which we would like to remove. Any suggestions as to how we determine what to budget for that? Don’t know but I do know that is something you could do yourself in a day. Hi! We bought an 1890 “New Englander” fixer-upper before fixer-uppers were cool. 🙂 We’ve been picking away at it ourselves and would love to remove the vinyl siding that was installed approx. 20 years ago. It looks like they tacked on the blue foam insulation boards and then the siding on top of that. We also think they blew in some foam insulation at some point as well… Ugh… There is beautiful clapboard in our enclosed porch (that is in beautiful shape), so we know that that is hiding underneath (and we are keeping our fingers crossed that it hasn’t suffered too much damage from having been covered). There are a few things attached to the house, though, that are holding us back from ripping it all off ourselves: the electrical meter owned by the power company and the stove pipe for the wood stove that we installed a few years ago. Any advice/suggestions on how to handle this? And, aside from these obstacles, is removing vinyl siding something that we can (or should) tackle ourselves? The separate garage/barn doesn’t have anything attached to it…. Thank you! I have heard that people remove it themselves lots of times but personally I would hire someone. There’s a lot of tugging you need to do on top of that ladder. As for the electric meter you would need to call the phone number on your bill. Best of luck! I am so happy to find folks who hate vinyl siding as much as I do!! Our last restoration was a 1926 stucco, very neglected but untouched. Both homes we are interested in now are vinyl sided. 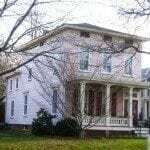 Both built before 1890, the larger home has asbestos siding UNDER the vinyl siding, plus both interiors have been severely remuddled. There are areas where there are weeds growing in the space between the vinyl and asbestos and the window sill, plus they used “great stuff” to fill holes in the foundation! Argh! My question is: is there a certain way to remove the vinyl (and the asbestos) with minimal damage to the wood beneath. Thanks. I really don’t know of the best way to do it. Maybe someone has experienced removing asbestos reading this. I’ve done a lot of reading about asbestos shingle removal and I learned that you first need to learn what your city/town allows for. City of Boston allows for removal without encasing the house… Disposal needs to be paid for, as it’s a haz mat and that’s probably in every area of the country. There are many you tube videos on how to properly remove asbestos and it’s about limiting disruption of the asbestos particles into the air: spray water onto the shingle, remove nail carefully (the video discusses what tools) and try not to break the shingle before disposing of it the way your area requires. I hope this helps. Late to the party, but in case anyone else comes across this article and discussion, that has the same question – yes you can remove the inappropriate siding yourself. My husband and I have been removing the tin can siding from our house and restoring the original wood clapboard siding underneath. We have about 5 months of winter here, so it is taking a little longer, but I assure you, it is absolutely worth it!! We have had countless neighbors and strangers stop to tell us how amazing our house looks. We discovered not only standard wood clapboards, but fish scale shingles in the gables, and an extremely unique “corduroy” siding on the front of the house!! My wife and I are preparing to remove the vinyl siding from our 1760 colonial. Like yours, the ends of all of our window sills were chopped off to accommodate the vinyl. Any tips for how to repair those? 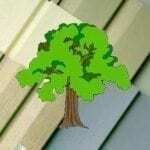 I’ve seen a couple of articles where builders described creating a jig and routing the sills in order to create a uniform surface to add new stock to the ends, but both articles were a little vague on the process. Good morning! Love your site. I’m removing vinyl from my 1905 North Carolina mill house. Most of the wood beneath is in good condition, and will only need prepped and painted. …those wicked vinyl siding people from the late ’80’s nailed all that foamy insulation stuff to the outside, and left about a million little nail holes. What do you recommend I use to fill those? Caulk would be the fastest fix. Sometimes the paint will fill them in too. Hello, this discussion has been very helpful and I’m glad to see I’m not the only one happy to be pulling off my ugly, faded vinyl. I’ve read through this discussion and a couple others, but still don’t feel like I have a definitive answer to my question. I’ve removed a section from my back wall, top to bottom, on our single story, mid 1950’s ranch. The original siding underneath is in nice shape, with a few cracked boards, no significant rot, but a LOT of large nail holes from the vinyl that was installed over the top. My question is, what’s the best way to fill these holes and repaint without the repairs being obvious? I’m unclear on the process-it seems like filling and sanding would work, but without the right filler and paint I’m assuming you will be able to see all the holes upon close inspection (or after a couple years of weather). I am doing the work myself, and it seems the only answer I get from a lot of pros is to just reinstall vinyl-it’s not cost effective for them to take the time to fill the holes. I have the time, and would love to save the money. Any information would be greatly appreciated! I recommend using a good quality caulk for the holes. I have the exact same dilemma. What did you end up doing? I tested out wood filler, Abatron WoodEpox, and various caulks. I determined wood filler was too time consuming since it required sanding. WoodEpox took too long to apply and it was a challenge to completely fill in the holes. Caulk was quick, easy, filled the holes all the way, and is more flexible, which should prevent the repair from developing cracks around the hole. Option A (cheaper, has held up great for past 3 years) – A high quality acrylic-latex caulk rated for exterior use. Make sure it is labeled as paintable, but avoid buying any products labeled ‘painter’s caulk,’ which tend to crack because they’re not as flexible. Some products are a silicone/acrylic-latex blend, which offers added flexibility while still being paintable. But do not buy a caulk that is solely silicone-based, because they’re not paintable. @Will, I have a very similar house (1950s ranch) and same dilemma. Old wood siding under the vinyl, thousands of nail holes, and some broken boards. What did you end up doing? We’re in Vancouver, Washington starting our DIY job this weekend. I bought a single story house made for a vinyl lover. It’s completely covered with faded vinyl siding and even to my amateur eyes, looks poorly done. My goal is to have it completely removed and return back to stucco. Now, where do I find a contractor to take on the job? And does anyone know about how much it will cost? I live in Southern California and its rare to even find homes with vinyl siding as the elements don’t call for such treatment. Any advice is appreciated. I would find a carpenter that can restore exterior features and repair wood siding. The easy part is removing the vinyl. Replying late to this fascinating conversation about ugly vinyl siding. We’re halfway through a DIY removal job of dual vinyl & asbestos shingle/tar paper sidings to unveil the very well-preserved 125 year-old clapboard beneath. We’ve patched and painted as we go along, and in answer to Will above, an excellent product for filling nail holes is Crawford’s Painters Putty, a linseed oil based, non-toxic product which I use my fingertips to smooth into the holes. It smells heavenly, if you like the smell of linseed oil and so far has worked great to fill the bazillion nail holes that the inept vinyl siding folks seemed to think necessary! I have asphalt shingles and an extra layer of vinyl as well (front of house only) covering my 1905 clapboard row house. I pulled some off in the back to see how hard it would be to remove; not hard, but holes from both the tar paper and the shingles left behind. I expect there will be thousands of holes to fill. And many nails to pull. I’m going to figure out how to test the shingles for asbestos. Anyway, would love to see pics of your project as it sounds similar to mine. I still have the option of having the Hardie people tear it all off and replace, but hate to trash what might be fine clapboard. If anyone regrets their decision (either way) I’d like to hear your experience too. Loved your website as I too am on the edge of removing vinyl siding from my simple 1930’s bungalow just outside of Boston and was afraid the vinyl guys would prevail but I have been determined to see the shingles underneath but worried about the nail holes and whether the previous vinyl siders cut off the edges of my windowsills on the exterior. Well, I have seen solutions others have used to fill nail holes (Crawford’s and a quick dry caulking) on this website and I’ve overcome the nail hole fear, so I am in!! Thanks everyone. I will post photos as I progress. I didn’t intentionally buy and old house with beautiful gumwood on the inside and hardwood floors to continue to live in a house wrapped with vinyl! I’d like to share some photos of the removal of my siding, but I’m not sure how to do that. I also have a really good photo of vinyl windows vs wooden ones as I removed the vinyl ones the former owner had installed. I agree about using Crawfords painting putty for holes, works magic in my mind and I like the smell. Seems a lot of people want to remove their siding but aren’t sure how to go about it. Just do it, you’ll never regret it. If it helps, do a small section to see what’s underneath and get an idea what’s lurking under there. It isn’t an inexpensive project, but you could do a bit at a time. Really late to the discussion. I too have been thinking about taking off the horrible spray painted red vinyl siding from our our 1920’s Eaton Catalogue home in rural Alberta Canada. It’s going to be a very long discussion with the husband but I’m stoked for the challenge. Keep trying. You will never have curb appeal until you do it! I bought a 1930s lake cottage. I want to remove the siding, but I can see that the siding looks like it was cut away near the door openings. I’m afraid to discover what I will find around the windows. I will work on one wall first. Advice? I guess just replace the cut boards? Anyone else have the same experience? I have a mid-19th-century house that a previous owner installed vinyl siding on (over the original wood clapboards). There’s a one-room second-floor addition on the back, but it only has a window on one side. We want to have two additional windows, but I’m having trouble planning. We can’t remove the vinyl, yet, but I hope to several years from now–we’re stuck with it for now. I know we can make a casing that looks right with the vinyl siding, but what happens when and if we remove the siding and go back to the original wood? I’m afraid to go to all the trouble of getting this right now, only to end up with a window that protrudes once the vinyl layer is gone. Does that make sense, and do you have any suggestions? Yea – I see what you mean. Not sure. I would probably wait and do it all at once with the vinyl removed.